Only ever seen a handful of these converted, so thought I would share this one and give the old Model C some love. 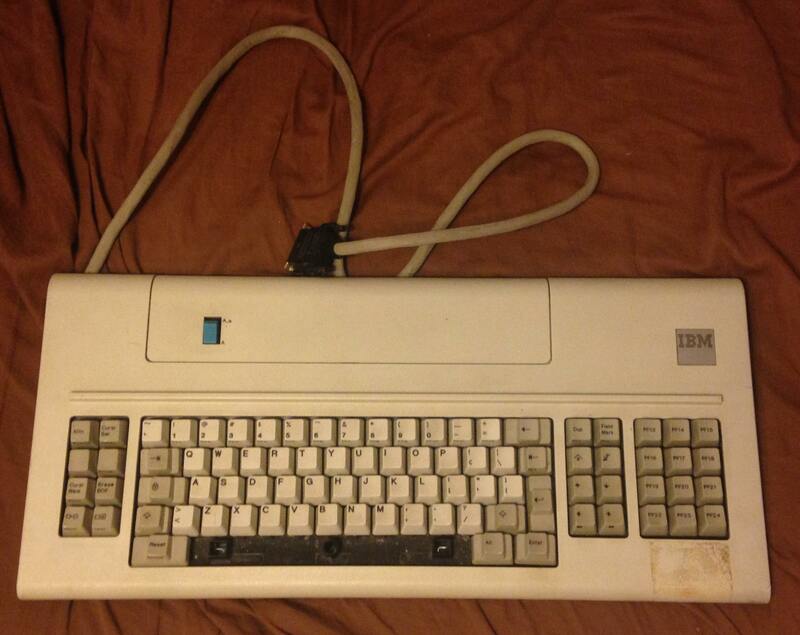 So this is probably the most oft-maligned member of the Model F family. Little more of a pain to convert, case doesn't like to be shipped like the F122 but worse, needs a new armature for the blue switch to have a place to sit and work, and a layout that belongs to late-70's terminals more than anything. Fortunately, I love late-70's terminals and use this kind of layout more than anything so it's a natural fit, doubly so since it's basically a Model F of my 3278 beamspring. 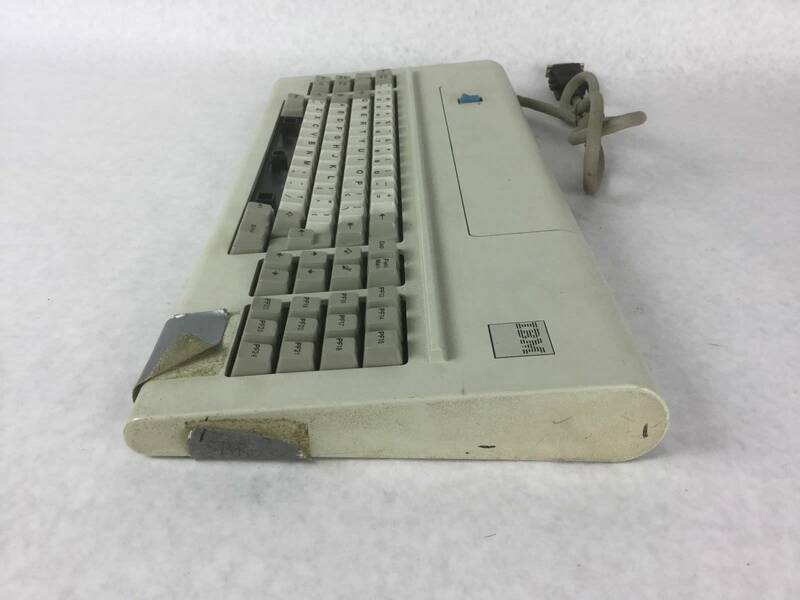 This one was no exception to the stereotype in having all but one of the internal screw mounts busted and a missing spacebar. The side was even held together with duct tape. Only thing that really disappointed me though was it had outlines of the extra feet on the back which meant it had them on for a long time they were lost by the time I got it. Foam still good. I love that about these models and the XT's. So many of them have the stuff that's good practically forever. Module removed. I had to sand and repaint the barrel plate but the backplate is immaculate. Original controller removed and excess foam trimmed from module. Now repairing the case. I used the usual heavy duty epoxy for a couple hairline cracks and reassembling the jigsaw puzzle that was the right side keyboard screw mount. I also reinforced the weak spots on the mounts with putty. You can't see it with the module in. For the top I was able to reuse the brass insert that survived and used an M3 nylon standoff for the other. Both solidly encased in blocks of epoxy putty that also reinforce the corners. Side effect is it makes where you rest your hands on the board when typing feel way more solid. I recommend anyone with one of these does this reinforcement, not just for the reinforcement but because it fixes so much about the perceived flimsiness of the case. Also, notice the top door for the dipswitches is melted shut. Didn't feel like cutting it back open because there's nothing there you'd actually want to get at anymore. For the proper conversion, I used the good old DMA Commonsense with Cypress 059 and a home soldered xwhatsit solenoid board (for anybody making their own, don't forget you can leave out the led circuit if you're not going to use it, saves you like half a buck). I used a scrap piece of aluminum angle I had left over from an amp project for the controller bracket and a scrap piece of PCB for the blue button mount. The blue button is hooked up to the top row and has its own column. It's a two directional on rocker, so I only hooked up one direction to be able to use it as a latching shift/caps just like it originally was made for, though you could also reprogram it like a layer lock key. I've seen a couple other people hook it up as the solenoid switch, but I can do that in software and this C2 has a dedicated key for that. Finally, all clean, back together and fully operational. C2 PF caps replaced with C4 numpad caps. Gotta say I love this look. And it feels and sounds amazing. Hard to screw up a Model F in that department though. Shame so many of these get scrapped for solenoids and parts, but sure helped me out with some of those parts being available to get this old girl going. Thanks to orihalcon for the awesome replacement spacebar and C4 numpad set. Last edited by Sangdrax on 16 Sep 2018, 23:12, edited 1 time in total. Layout isn't that bad, works very fine as a fake TKL. You did a great job, I'm so envious right now! Nice job on the restoration. I wish these got more attention, I honestly think the 3278 layout is a little bit better than the XT layout. Wow great job on this one. Cheers for posting your work. I've got one in the mail on its way to me as we speak and this is going to be invaluable as I work on restoring and converting it. Thanks guys. And yeah, you hit the nail on the head how I use this kind of layout. Left side is layer selection plus Esc/Solenoid/PrintScreen/etc while nav block is used as a media key block in the layer where the numpad is a tkl. All works pretty great in daily use and still have a number pad and Fkeys to punch up when I need them. As far as layouts go, I personally like numpads in place of nav clusters, some buttons on the left side and an F-row up top. Standard fullsize is nice too if it can have a T-nav. But I don't like funky stepped keys in my numpads either. So my grade on F's just on layout would be like. Actually, with how popular the spacesaver versions are with other folks, I'm a little surprised these haven't been historically chopped up for knockoff kishy's, especially those ones without numpads. It would be very easy. Though there's not much call for it now with the Ellipse stuff so close to done. Very nice restoration job, mate. Glad someone showed some love to the blue switch Model Fs. I love the layout. Even though I'm mostly an originalist, I was still thinking how one of these would look nice in a black case like your 3278. In other news, I just figured out one thing I screwed up. The USB micro cable I used was a phone charging smart cable and it was choking the current to the solenoid. Swapped that out and got the full volume going. Now it sounds more like my 3278 with the plastic case. Also tossed up a NIB BTC 5149 typing test since I had the tripod out just because. Nice! These do seem to be overlooked. 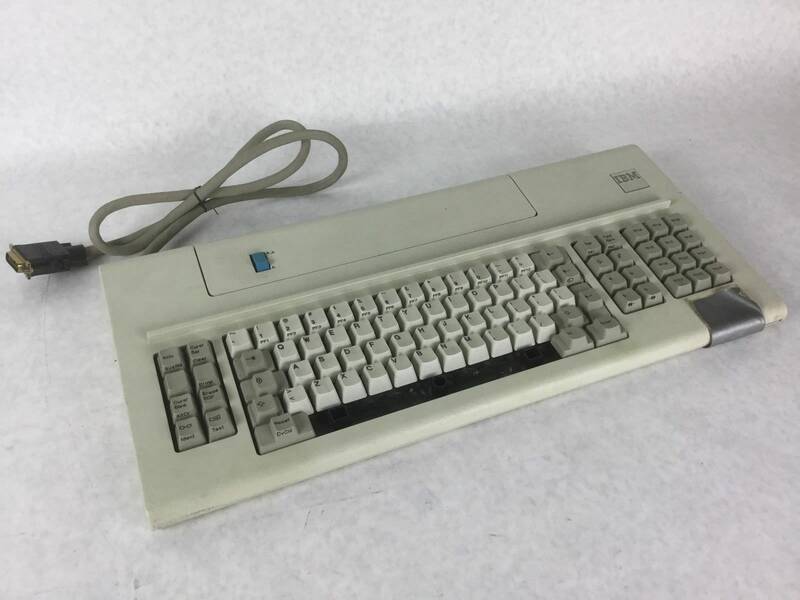 Maybe part of it is the case which is not as solid as the other Model F's I've seen, but the layout and solenoid make up for that I think. I used a purchased Xwhatsit and solenoid driver for mine and it works fine, but I really like the approach you took! Also like what you did with the blue rocker switch - mine's just decoration at this point. 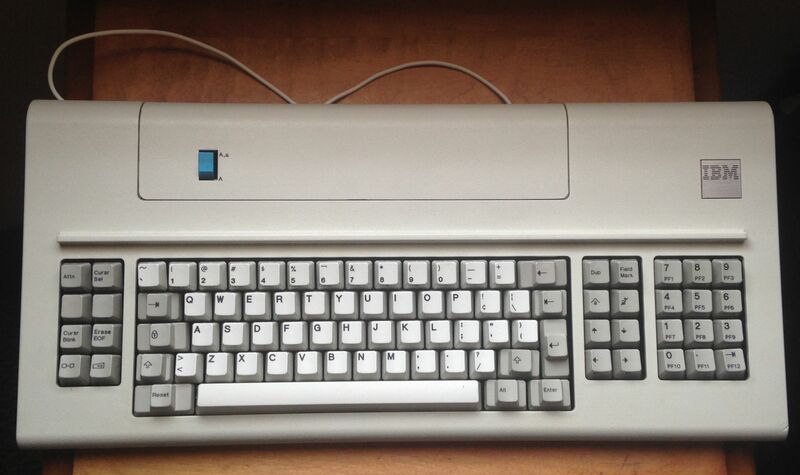 One more blue switch model F here (fully restored, foam was basically non existent). As other have put it before; an absolutely lovely keyboard. Though mine is "missing" a numpad. Cool board IKSLM. I love seeing a couple others pop out of the woodwork. QWERTZ can't be that common either. OldIsNew wrote: ↑ Also like what you did with the blue rocker switch - mine's just decoration at this point. I really wanted to give it its own row but the bus was limited to 8 pins in firmware and I wasn't sure how to add another. But extending an existing row works well, even if the much higher values for the blue switch pull up the whole row a bit. I also have my work cut out, but thankfully also with the assistance of orihalcon, I should be able to restore it. The foam is shot though, it just disintegrated when I removed it. Cleaned up what I've got so far and hoping to have the barrel plate sandblasted and powder coated in the coming week. Good luck. Looks like you have your work cut out for you but it's definitely worth the effort.